How far would you go to help someone that you’ve never met? And how would you feel if, one day, you were told that a group of complete strangers gave you a gift, no questions asked? That happened recently at Movement Mortgage. And in classic Movement form, this story of giving comes with a twist. 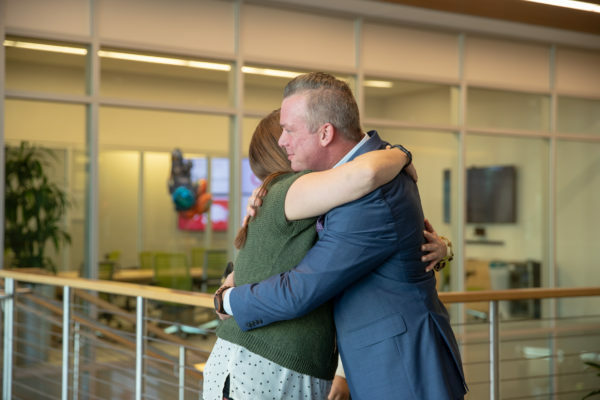 The plan was simple: Record the moment that Movement Mortgage Regional Director Mike Brennan finally met the stranger that he managed to raise thousands of dollars to help. But as Mike walked out of the doors to meet his surprise guest, there were no tears, no excited screams or anxious laughter. He simply smiled, gave the girl a hug and said hi. 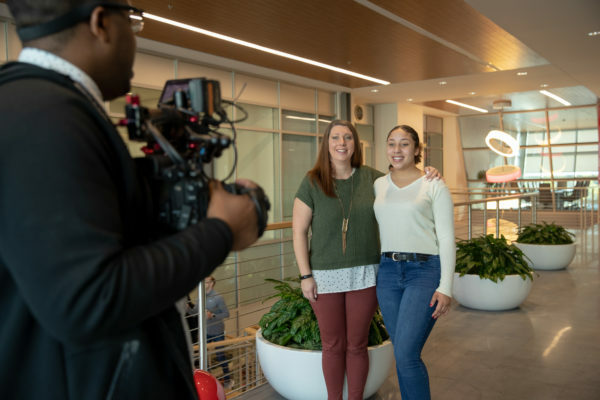 The questions started when Mike and processing manager Christin Douglas happened to strike up a conversation during one of his leadership trips—a conversation about Type 1 diabetes. Christin isn’t diabetic, but her teenage daughter Mya is. Brennan is, too. Recently, Christin showed off the new app they had. It allowed Christin to track her daughter’s blood sugar levels so she could remind her to take her insulin shot if Mya forgot. Mike said that’s great, but she needs something better, an insulin pump. He has one himself, and research shows using the pump can add years to a diabetic person’s life. There was just one catch, an expensive one. The insurance plan Mya was under would only cover a portion of the cost, leaving Christin with a $6,000 bill she couldn’t possibly afford. Brennan sent an email out to a couple dozen colleagues asking for their help. Shortly after, Christin’s Venmo account was dinging. In less than a week, Movement teammates had stepped up and raised the $6,000 necessary to buy the pump for a girl many of them had never met. On a busy Wednesday morning in Fort Mill, Mike Brennan stepped out of some double doors and walked toward two women. “I knew it was her, immediately,” said Mike. No longer strangers, Mya finally got to meet the man who helped her without hesitation. They hugged and laughed, said their thank you’s, then argued over how much Mya looks like her mother. But what Mike and Mya both agreed on was that this meeting didn’t happen because of them—it happened because of Christin Douglas. With a wry smile on her face, Christin told Mike that she recently found out she didn’t need the whole $6,000. As it turns out, the insurance plan covering Mya had changed and so did the payment. Instead of owing $6,000, Christin only needed to pay $1,000 out of pocket. But what to do with the remaining $5,000? “I thought about giving the money back to everyone who had donated, but they specifically donated that money to help people,” said Douglas. She decided to pay it forward. Some money went to a Movement employee who also has a daughter with Type 1 to pay for a new testing unit and insulin. Another portion of the funds went to a Movement teammate who recently had brain surgery and is still in the hospital, to help pay for medical bills. Yet another portion was donated to a Movement teammate to help pay for her mission trip to Uganda. “I’m not surprised because I know how Christin Douglas is, I know how much of an impact she has on this company,” Brennan said, adding that if he had needed to, every hour he could’ve gotten 30 to 40 more people wanting to help. Do you know someone making a change in their community? We are looking for the humble servants, the hard-workers who rise above circumstance, and we want to tell the stories of all the good our Movement family is doing. Send your Changemakers stories to Jennifer.Bates@Movement.com.